What an experience these past few months have been! Three months ago when we moved from the coast to the mountains, I didn't realize that my watercolor palette would also require a major adjustment. It only took a week or two of painting to see that my coastal palette wasn't going to cut it here. Coastal light is almost drunken with humidity, warmth, and salty goodness. As a result, colors appear more muted and edges are softer. But in these mountains, the light is cool and clear. Details are crisp, and colors can seem blindingly bright, almost as if they're lit from within. I needed pigments in my palette that were capable of capturing this brilliant light and the resulting luminescence... at least as far as my limited artistic skills would allow. After MONTHS of experimenting (I exaggerate not), I think I've nailed it, or at least built a watercolor palette that will work for me. I'm holding fast to 12 colors that seem to capture these high country hills and also the little things I've discovered along the way. All of these watercolors are single-pigment shades or comprised of only one pigment. This isn't a necessary trait to have in watercolors, but it's one that I prefer. Click on the color names above to see the exact brands that I used for this post. When shopping for these hues, remember to go by the pigment code (usually located on the back of the tube) instead of the color name which means nothing and varies between manufacturers. You can learn more about that here. To see a comparison of the top brands of watercolors, check out this article. 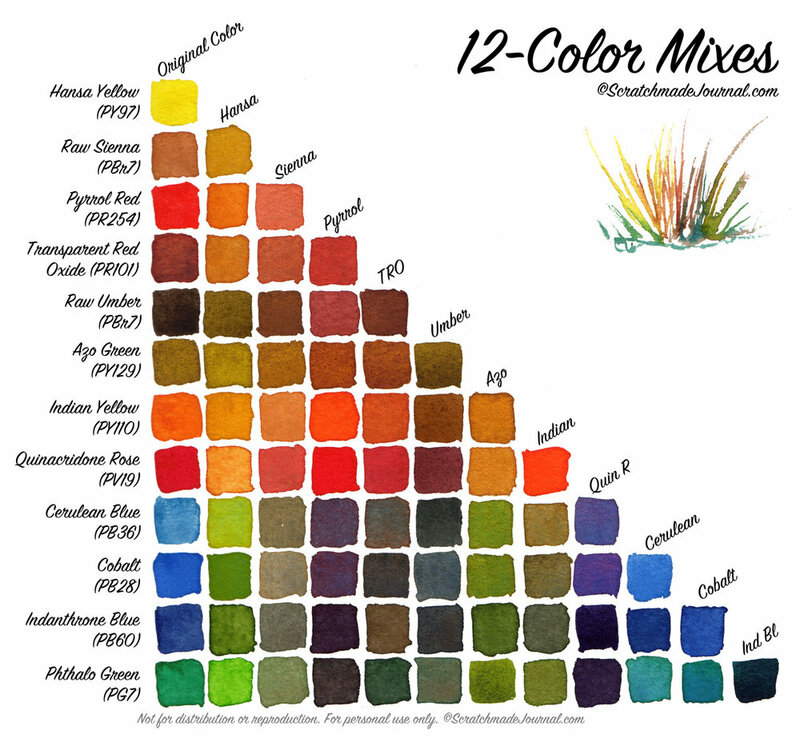 This chart is a tiny, tiny sampling of the plethora of colors you can mix using these 12 pigments. For better viewing, click on the chart to enlarge it. You can find instructions on how to read this mixing chart plus a free printable to make your own at this post. As with any palette this large (or any with more than 6-8 colors), expect repeats when mixing. For example, Indanthrone blue mixed with Hansa looks suspiciously similar to Indanthrone+Azo green. The same when comparing Hansa+Pyrrol and TRO+Indian mixes. There will be more of a variance at each end of the mixing range, but it's actually an advantage that there are multiple ways to mix similar colors. Since you don't always have to remember a specific recipe to mix an exact color, having multiple ways to go about it makes things much easier! Lately I've been posting a lot about watercolor palette options, so I hope the simple Q&A below will help clear up any confusion regarding these various palettes. If not, please feel free to leave me a comment. I love to discuss color! ...the 6-color palette? Do I now need 12? Nope, not at all! I think the 6-color palette works marvelously in every situation, and I really like the 4-color palette as a great minimalist option. However, my palette has 12 slots so... Seriously though, I really don't need 12 colors, but having a handful more is certainly convenient and reduces mixing time so I can capture an image much faster. Several of my watercolor palette options contain Phthalo blue red shade (PB15), but since I had room in this palette, I really wanted to add additional blues— very helpful when painting skies and water! Though I love phthalo blue, I felt that I needed more of a midrange blue to sit between Cerulean and Indanthrone, so I went with cobalt. It's working out well in these high country hills. I totally get it. Some of these colors are pretty intense! When I first began painting, I tended to avoid highly staining and granulating pigments because they can be a bit stubborn. In a mix, the earth tones and yellows in this palette can calm down the staining pigments strength, but if these are still too much for you, I've listed some lovely alternatives at the bottom of the 6-color post. ...painting botanicals, urban sketching, etc? I'll be completely honest with you: I have no idea. Though I think these 12 colors could be used for sketching and painting any subject, I'm a mainly a nature sketcher and landscape painter, so I chose this palette for those uses. As always, I encourage you to compare my choices to other's suggestions. And then go with what works for you! That's totally up to you! Some folks love big palettes. However, I've decided they're not for me. I originally planned to refurbish a 24-color palette, but I've since discarded that idea because when I moved from using 6 colors to 12, I actually felt a bit overwhelmed by all of the choices. I soon settled into using 12 colors, but I'm more than content with 12 and don't plan to add any more. I'm happy to share a free, PDF version of the 12-color mixing chart for your own, personal use. If you would like to keep up with this blog via email and be the first to know about giveaways, free printables, tutorials, and more, sign up here. Note: Just click on the button below to download. The PDF may open in a new window & you may download or print from there. Print size is 8.5 x 11 inches in landscape format.